Trajan’s Column is located in Rome, Italy, and was built in 113 AD. It honors Emperor Trajan, and at that time it was situated at the new Forum of Trajan. It commemorates victories by Trajan in Dacia, which is now Romania. The column is 138 feet tall and it is situated very close to the Piazza Venezia. There is a beautiful band of carved reliefs that wind around Trajan’s Column. This relief band is approximately 600 feet in length. Its width at the bottom is two feet and is about four feet at the top. It contains nearly 2,000 carved figures that depict the history of the Dacian war battles that occurred during 101 to 102 AD, and also 105 to 106 AD. The reliefs start with Roman soldiers getting ready for the war, and it concludes with the Dacian soldiers being removed from their country. The column is made up of 29 white marble pieces, and the biggest one weighs about 77 tons. The reliefs had not always been white, but had originally been gilded and brightly colored, like so many other ancient Roman monuments at that time. When it was first constructed it was one of the most remarkable towers in the world. Originally, there was an eagle statue at the top of the column, but, after Trajan died, the statue was removed. It was replaced by a 20 foot tall statue of Trajan, riding on a horse. His ashes were placed at the column’s base. In 1587, his statue was removed and replaced with a St. Peter statue. The scenes depicted on the column include a complete range of military activities, such as fighting, marching, building and collecting food. In addition, they depict details of the various lands that Roman soldiers marched through, as well as the enemies they battled against. Many of the figures are nearly life size and are quite detailed. The column has a helical stairway inside of it. The workmanship exhibited in the stairway is very extraordinary. There are many windows that were strategically built that offer enough light to see when walking up the stairway. They were placed very high so people could only see the sky when looking out of them. The top of the stairway has a viewing platform. This view, in ancient times, gave people a wonderful look at the Trajan’s Forum, Campus Martius, Capitol Hill, and the Markets of Trajan. Ancient visitors could view the wonders of Rome once they reached the top. Today, you cannot get up close to Trajan’s Column, but you can still see many details. It is well preserved after it being partially buried following the collapse of Roman Empire. It was excavated by the French, between 1811 and 1814. 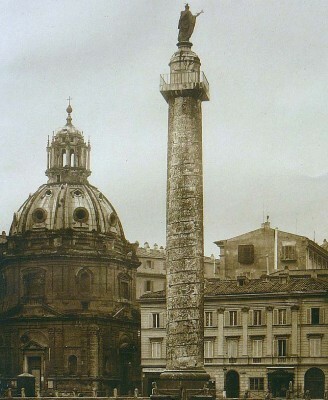 Visitors have to enter the Trajan Market, which is free, in order to see the column. The first century market area is well maintained, and not very crowded with people. It is an interesting place to visit.